GCDT Simply Sunday Challenge: Arrrrgh Matey! I'm back with another challenge from Getting Cricky! Today's Simply Sunday Challenge is: Arrrgh Matey! Create a project with a pirate or fish theme! Well, since I recently created a project with a pirate on it, I thought I'd go for a fishie today! I figured that this card would be fitting for this week. I'm nearing the end of my design team term with Getting Cricky and K Andrew Designs and I wanted to create a card of encouragement! And how appropriate: I'm ending with the sentiment stamp set that started my love for K Andrew Designs stamps! 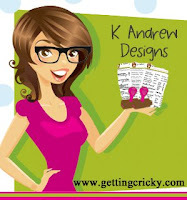 Thank you to Kristal and the rest of the Getting Cricky Design Team! It's been a fabulous 4 months and I'm super honored to have been designing alongside you ALL! Getting Cricky's "Getting Cricky With It" HOP! For my Tiffany Doodles Tiffany Tutor post CLICK HERE! Welcome the “Getting Cricky With It” Surprise Blog Hop for Kristal!!! Today the Design Team is bringing you some very special projects created for our wonderful and amazing leader Kristal! Our term is almost over and we wanted to show her just how much we appreciate ALL that she has done for us this term. The projects that we will be sharing with you will also be sent to Kristal. We encourage ALL of her fans to join in on the fun as well! Be sure to add your card/project to the link below and then be sure to mail it off to her! Here's my card for today's HOP and for Kristal! For my card today, I really wanted to use the Coffee & Tea for You & Me Set so I paired it with one of my newest stamps from Sweet 'N Sassy Stamps! I'm really loving creating cards with coffee images - I'm slowly becoming addicted to coffee! I'm trying to limit myself, but I'm finding that, with me working nights, AND me getting older (and the kids getting older and busier), it's harder to stay awake! Anyway, here's the fabulous set by Kristal! Anyway, the hop still continues! Now you can dance on over to your next stop: LETILLIA'S BLOG! 20. JoAnn <--- you are HERE! 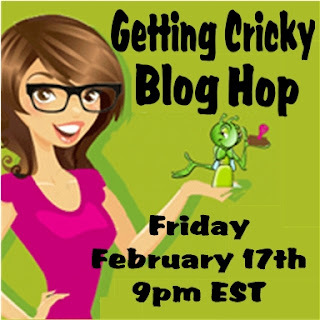 Getting Cricky's Blog Hop: Cabin Fever! Welcome to the "Cabin Fever" Getting Cricky Blog Hop!! We're so happy you could join us for this month's Getting Cricky Design Team Blog Hop!! We have an EXTRA SPECIAL hop for you this month -- All week long, the Design Team has been featuring many of Kristal's stamp sets as well as an array of Cricut Cartridges, SVG cuts, and more in anticipation of the hop... If you've missed out on any of the week, be sure to check out our previous posts for MORE THAN 100 CREATIVE IDEAS and PROJECTS as well as giveaways, promotions, tips, and tutorials!! Kristal's stamp sets are perfect for cards, layouts, and so much more... For my project, I'm featuring the Pirate Tales & Fish Scales sentiment set! I stepped out of my comfort zone and created a little tag/bookmark! I thought this would be perfect to give to any friend as sort of a "pick me up". How cute is this little pirate bird? :) And even better, how perfect is the sentiment?! Anyway, there's an awesome promo going on right now so if you've been thinking about purchasing a K Andrew set, you might as well pick up a couple more: Buy $25, get the Mini Heart Bonus Set for FREE!! Now you can hop on over to your next stop: Larelyn! Thanks so much for stopping by today! Hope you enjoy the HOP! Birthday Sundaes #39 - Winter Birthday, Photo Inspiration, + include a Snowman! Birthday Sundaes #38 - we're BACK! I'm super excited because Birthday Sundaes is BACK with more challenges and more fun! After our holiday hiatus, the Design Team is well rested and ready to share more Birthday inspiration with all of you! We've got a fabulous sponsor this week as well! supplies: Everything is a from a really old Taylored Expressions Key Ingredients Kit - November of 2009 or 2010. image: Winter Leah (Whimsie Doodles); sentiment: Winter Wishes ("warm", "wishes" K Andrew Designs), Coffee & Tea For You and Me ("birthday" - K Andrew Designs), Copic Markers. Simply Sunday Challenge: It's a Celebration! It's Sunday and it's time for another Simply Sunday Challenge over at Getting Cricky! This challenge is all about CELEBRATIONS - so put on your thinking caps and create a project to celebrate a new job, a new home, an anniversary, etc. - whatever your crafty heart can come up with! Hope you get to play along with us for our Simply Sunday Challenge! This challenge runs for 2 weeks so you have plenty of time to get your creativity juices flowing! For more inspiration, stop by the Getting Cricky blog to take a peek! I wanted to be sure I popped by to wish you a very wonderful and Happy Holiday season! Lots of blessings to be thankful for and lots of joy to celebrate! I hope my little Christmas wish finds you all, my bloggie friends, peace, joy and love. Anyway, I made a quick little video the other day to announce my Kat Scrappiness DT adventure and to show off the last 3 cards I've posted these past few days! Enjoy! Again, thank you all for visiting me! Hope you all have a wonderfully, fabulous Christmas Day! I think I'm pretty much in disbelief that Christmas is arleady TOMORROW. I've been done with Christmas shopping for a while now and all I have to do is wait for the kiddos to unwrap and enjoy everything. Since the hubs is working tonight, though, we're going to pretend that Christmas Day is Monday. Thankfully my kids can't read the calendar yet so they won't know. But I figure that with my husband working tonight, he'll be missing church in the AM, we have plans for lunch at his sister's house and then dinner at our house. The kids won't have time for the Christmas morning joy in the morning and I don't want my husband to miss out on it since they'll be sleeping after his shift is over. So I've got another card to share with you today! I've got some great news to share - Kat, one of my You Tube pals, invited me to play along as she launched her new design team for her Etsy shop, Kat Scrappiness! I'm super excited to work with such a talented group of gals and play with some adorable and fun FELTIES! For this card I used the Holly Leaf felties found at the Kat Scrappiness store. 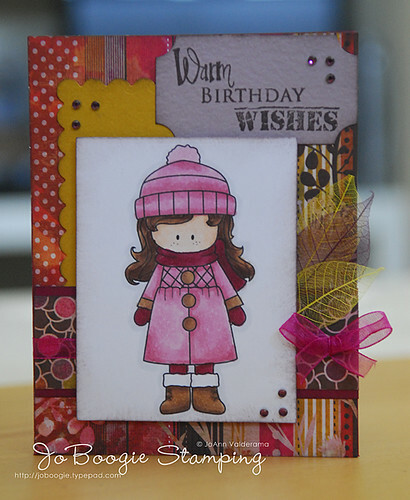 I love how felties add dimension to an otherwise drab-looking card! I finished the card off with another sentiment from K Andrew Designs' Winter Wishes set. <--- another reason why I'm loving creating Christmas cards this season! I have a question for you all today... If you're a crafter, have you ever gotten comissioned to do a project because you're the "crafty" one? I'm usually the one who gets asked to do birthday cards, thank you cards, appreciation cards, etc... And with Christmas coming up, I was asked to create a card for J's pre-K teacher on behalf of his class. I kind of didn't know where I wanted to go with this project, but thankfully, one of the moms in his class steered me in the right direction with the creative ideas, and sent me a few links to several projects. And I LOVE the thumbprint project idea! I created the card to be 5x7 because I wanted to make sure I got all the kids "thumbs" on there without cutting anyone off or leaving anyone behind. I figured a grid pattern would be the easiest so that's what I did. I was toying with the idea of creating ornaments somehow, but I wasn't sure how that would pan out, so I just stuck with it being simple. I think it worked, don't you? I doodled the faces, ears, and antlers with my markers - I don't consider myself as much of a freestyle artist, but I'll let you be the judge of that! *lol* I finished each little square off with some sponged ink around the edges and wrote each of the kids' names on the bottom. The other moms in the class have already given feedback on how much they love the card. I hope J's teacher does too!